Everything went very well at the opening Friday night in Philadelphia. 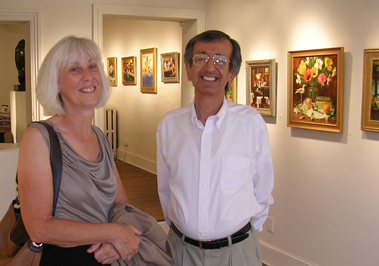 Here I am with Fred, the gallery owner, a man who is wonderfully passionate about painting. The show looked great, if I do say so myself, and several paintings sold while I was there at the opening. It turns out that the first Friday of the month is a big time in Old City, Philadelphia, with galleries staying open until 9PM and lots of funky bars and restaurants in the neighborhood. Philadelphia Style magazine published a great article about First Fridays which included an interview with Fred. The gallery has a new website and a new blog, where they published a short interview with me. 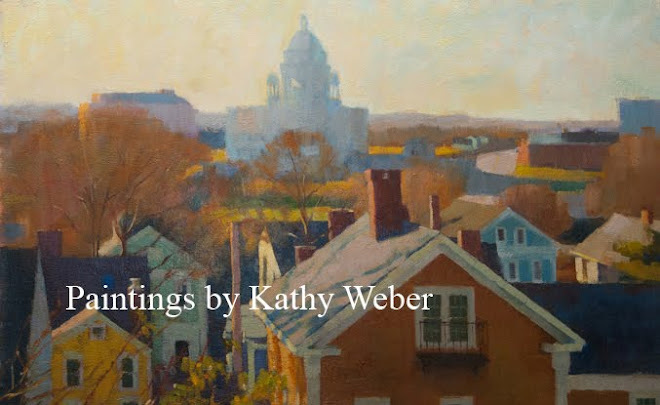 The show is up until October 1, although it will be closed Sept. 21-25 because of attendance at the USArtists show, which is a fundraiser for the Pennsylvania Academy of the Fine Arts. Fan..tastic! Just read the interview,congtratulations Kathy! Congratulations on the sales and a wonderful opening Kathy! Well-deserved. Congratulations on your successful show and sales! Your work is fabulous! Congratulations Kathy! Great gallery in which to have your work shown! Nervous about buying a painting? If you're not satisfied, you have 10 days to return the painting, and I'll return your money (except for shipping).